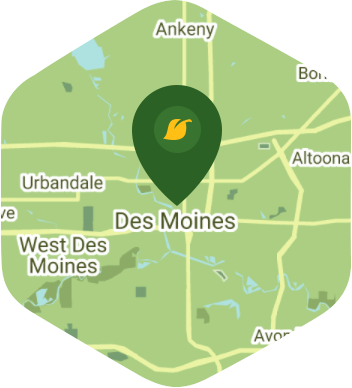 Book a skilled leaf removal expert in Des Moines. Backed by a total satisfaction guarantee and amazing customer support. Life in Des Moines is all about having fun and enjoying some much needed relaxation after working all week. The city is full of so many great things for you to do such as watching the Cubs play at Principal Park and getting surrounded by beautiful fauna at the Greater Des Moines Botanical Garden. You work all week and are looking forward to the weekend so you can enjoy your city's lovely attractions. The last thing you want do on Saturday is leaf removal, but don't worry because Lawn Love has that covered. The fall is when the leaves begin to shed and cover up the ground. This includes the trees around your property and while they may make your garden look beautiful, these leaves are anything but helpful. They have to be removed right away because they can suffocate your lawn. Lawn Love does leaf removal right and our independent lawn pros will work hard to make sure that most of the leaves from your yard are cleaned up. We are a fully bonded and insured lawn care company, so you can feel safe knowing that your leaf removal will be done the right way by experienced professionals. Get in touch with Lawn Love by calling at 515-305-3166. You can also check out our prices by asking for a free two minute quote.